Set your bike apart from the rest of the pack with this amazing eleven (11) piece Graphic kit! Available in two (2) color selections, graphics look so good when applied you'd think they're factory! Digitally printed with our DuraCOLOR graphic technology, kit is manufactured with premium automotive grade vinyl film materials. As a further step, graphic is covered with a 2 mil Gloss or Matte clear laminate which provides protection from miles of abuse. 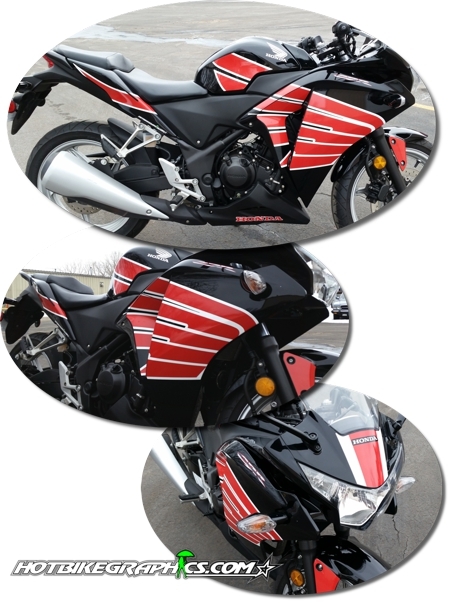 Created specifically for Honda's '11-'13 CBR250R, this kit will deck your bike out no time. While graphic kit is bike specific and will not fit any other motorcycle, this design can be fitted to other Honda bike models. Just ask.